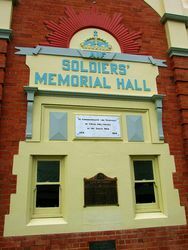 The Soldiers Memorial Hall was erected to commemorate those from the distirct who served in World War One. 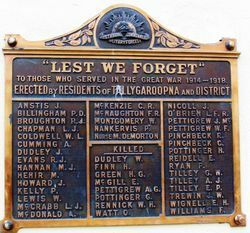 The Tallygaroopna community, met in September 1919 to discuss the best means of commemorating the men who served in the Great War, unanimously decided to build a new memorial hall. The existing timber 1880s Mechanics' Institute and Free Library, was demolished to make way for the next building. The foundation stone for the Hall was laid by Colonel (later Sir) Murray Bourchier, MLA, CMG, DSO, on 1 January 1924. Bourchier had entered the Legislative Assembly as the Victorian Farmers' Union member for Goulburn Valley in 1921, and the plight of the returned soldier had been his active concern. It was fitting, therefore, that he laid the foundation stone for this Memorial Hall in his own electorate. The building was later opened by Dr Earle Page, Acting Prime Minister, on 9 June 1924. The day was celebrated with a sports afternoon, dinner, concert and dance. An event of great interest to the district in general, and to Tallygaroopna in particular, has been fixed for June 9. On that date the soldiers’ memorial hall at that centre will be officially opened by the Federal Treasurer (Dr. Earle Page), The building is almost completed, only the finishing touches remaining to be done. The local residents are proud of the edifice, as they have reason to be, and they are looking forward with considerable anticipation to the ceremony to be associated with its opening. Special preparations are being made for the function and particular interest will attach to it from the fact that the Federal Treasurer will be present. A dinner will be tendered to Dr. Page at 12.30 p.m,, and at 2 p.m, the ceremony of declaring the hall open will be performed, to be followed by a sports a concert and ball in the evening. An advertisement relating to the ceremony appears elsewhere in today`s issue. Shepparton Advertiser (Vic), 15 May 1924. To Those Who Served In The Great War 1914 - 1918. This stone was laid by Col. M. W. J. Bourchier M.L.A., - C.M.G. - D.S.O. - V.D.